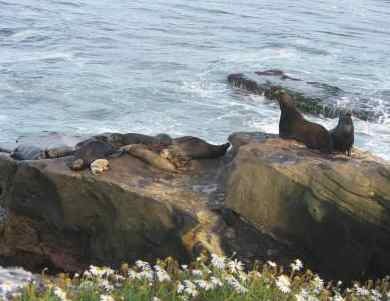 See the La Jolla Attractions along the La Jolla Coast Walk including the La Jolla Seals, Sea Caves, Children's Pool and La Jolla Cove. This is my favorite coast walk in the San Diego area. La Jolla offers something for everyone - beaches, great views, exclusive shopping and lush subtropical plants, and fine dining. 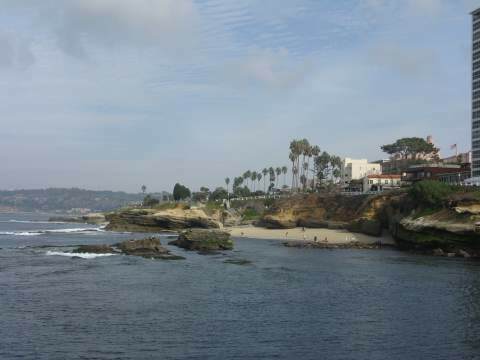 La Jolla, an upscale community in San Diego, California, is known for its spectacular coastline and scenic views. 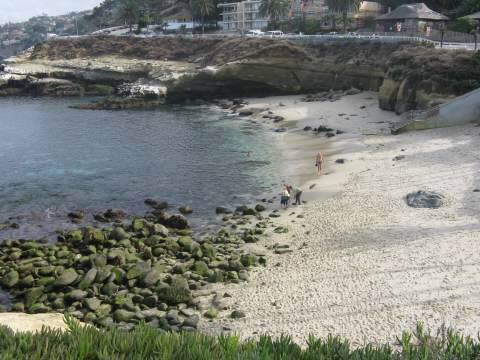 One of the best walks in San Diego is the La Jolla Coast Walk, where you can see all the major La Jolla Attractions. Best of all it is free, and with San Diego's nice climate, you can enjoy the walk all year around. The entire walk is about 1 1/2 miles. I like to start the walk at the west end of Coast Blvd, near the La Jolla Children's Pool. This tiny beach was partially enclosed by a sea wall for a children's swimming area, and for awhile ti was taken over by some nearby seals basking on the beach in the sun. Families have mostly returned now, but regardless, this is one of the best spots for taking La Jolla pictures, so bring your camera. If you walk out on the sea wall (low tide is best), you can snap some pictures of the beautiful La Jolla San Diego coast. You can also look down into the clear water and see interesting sea life. As you walk east along Coast Blvd. from Children's Pool, you will arrive at Shell Beach, a small popular beach for gathering shells. Take a moment and walk down the stairs to the beach to explore. Ellen Browning Scripps Park is a popular SD park located along the coast in the center of La Jolla Village. It's a great place for a picnic lunch, or if an event is happening, to join in the fun. At the east end of Ellen Browning Scripps Park is the La Jolla Bridge club, with a magnificent view of La Jolla Bay and Torrey Pines Bluffs. As you continue around the bend along the coast walk, you will frequently see more La Jolla seals, part of the colony of harbor seals that lives in the area. 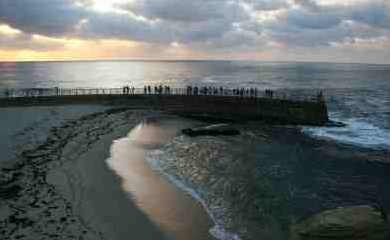 La Jolla Cove is a picturesque cove in the heart of La Jolla California, and is another great place to take La Jolla pictures. Once a popular swimming spot, it is now frequently used by open water swimmers and divers entering the area. Across La Jolla Bay you can see La Jolla Shores beach, La Jolla Beach and Tennis Club, and the cliffs along Torrey Pines State Beach. Past La Jolla Cove, the La Jolla Coast walk continues along Coast Blvd, past the birds hidden along the rocks. 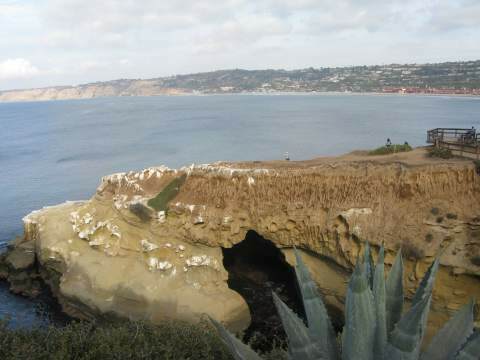 As you wind up the hill, on your left you will see the back side of The Clam's Cave, on of the seven La Jolla Sea Caves. A short distance further and you will see the Cave Store, where you can pay a small fee and climb down to Sunny Jim Cave. At this point the paved path will end and the La Jolla Coast walk continues on a dirt path. Most La Jolla San Diego tourists don't make it this far, so the walk is quieter. If you head down the steps to your left you can go to the outcrock of rocks and see the entrance to the La Jolla Caves, one of the most popular La Jolla attractions. To enter any of the caves besides Sunny Jim through the Cave Store, you need to be on a kayaking tour from La Jolla Shores. As you continue along the dirt path, you will wind along the coastline and enjoy more interesting plants and scenic views of the La Jolla coast. Directions to La Jolla Coast Walk from the north - From Interstate 5, go west on La Jolla Village Drive, left on Torrey Pines Road, and right on Prospect Street. Watch for the signs and bear right on Coast Boulevard (take the second entrance if the first one looks busy). Park on the hill or along Coast Blvd. Directions to La Jolla Coast Walk from the north from the south - From Interstate 5, go west on La Jolla Parkway, continue on Torrey Pines Road, and right on Prospect Street. Watch for the signs and turn right onto Coast Boulevard (take the second entrance if the first one looks crowded). Park on the hill or along Coast Blvd. Click on the link above to open the Google Map for La Jolla Attractions, including the La Jolla Coast Walk and other attractions in San Diego and southern California.